I started at Les Mills in 2003 as an Impact instructor and assistant coach for Fight Club. I also filled in occasionally for RPM before becoming a permanent fixture. I had been teaching RPM in Petone for the two years prior to that. I have always been into keeping fit, and exercise is a big part of my daily life. 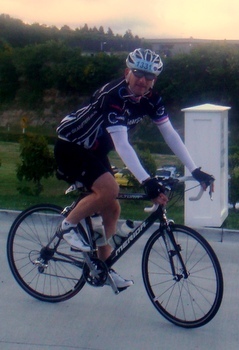 RPM has been excellent and has encouraged me to take up road cycling. I have found that my fitness has stepped up to another level and has given me far more energy to cope with work, study, my busy lifestyle and keeping up with my daughter. All the GearShifters squads have been highly enjoyable, with our past members achieving their goals and with most far exceeding what they had orginally anticipated. This next squad should be just as good - heres hoping the Wellington weather co-operates!! My biggest achievement to date has been racing in the 2011 Wgtn to Akld, and all my Taupo training played a huge part in my success, this time I hope to get sub 5 for Taupo and again participate in Wgtn to Akld also! I started riding about 12 years ago as a mountain biker to lose some weight after giving up smoking.Since then I've competed in just about every discipline of the sport including road, time trialling, track and even cylocross, and have ridden most of the major road events in the North Island. My first lap of Taupo was in 2004, with a PB of 4:23 in last years event. I have a real passion for the sport and have enjoyed helping and encouraging newcomers for the past 4 GearShifters squads, see you all soon! A coffee and a chat after the ride is a must do; cyclists are a social bunch. I look forward to learning new techniques, sharing my experiences,and meeting new and previous converts for the Taupo training rides. I am totally addicted- I love cycling and I know you will. See you on the tarmac. I joined GearShifters in 2008 as a very nervous novice. I brought a road bike a few months earlier, rode it twice, all of about 20 kilometres and decided I didn’t like this light weight twitchy bike with skinny tyres. The gym put me onto another novice cyclist and we ventured out around the Bays together, it was hilarious!We were both as scared as each other.That ride lead to a great friendship, we still cycle together, we just ride a bit further and a bit faster these days and we still laugh a lot. We joined GearShifters with the intention of doing one section of the Taupo Challenge, perhaps half if we were really fit.The training we received was fantastic, the trainers were great, they were helpful and patient, they taught us everything we needed to know took us well and truly outside our comfort zone.They gave us the confidence to have a crack at the entire 160k circuit!It was a very long ride but we crossed the finish line together. It was the most amazing sense of achievement I’ve every experienced. I’ve now completed 3 Taupo rides and 3 GrapeRides with GearShifters.I’m totally hooked!As well as keeping me fit, it’s fun and very social.I have met some amazing people and made some great friends through GearShifters.I’m looking forward to the start of this squad; there’ll be great rides and a lot of fun. See you all there! I learnt to ride when I was 6 and have been riding on and off ever since. I attempted Taupo on my own in 2004 & 2005 with both attempts ending up in the back of an ambulance on a nebuliser because I was woefully under-prepared. I took 2006 off for personal reasons, so when I heard about Gearshifters at Les Mills in 2007 I decided it was worth another crack and signed up. It was so much fun and gave me all the right prep to get around that I keep on coming back and have done the Taupo and Grape Ride squads ever since. 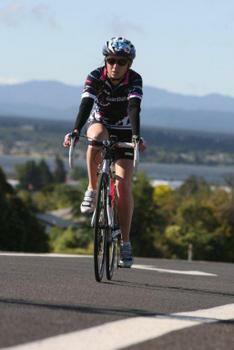 I've completed Taupo and Grape Ride 3 times now. Sadly injury forced me out of last year's Taupo and I didn't complete this year's Grape Ride so I have some unfinished business….. 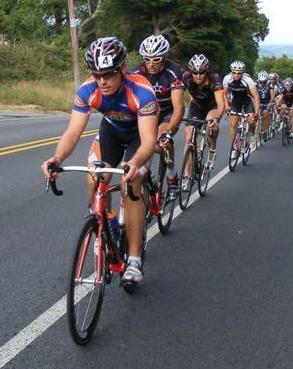 I've always played team sports so riding with a group really appeals to me. It motivates me to get out of bed on those mornings when I'd never do it if it was just for myself. The best thing for me has been learning to ride with a great bunch of people of all abilities in a supportive environment. It has given me the confidence to do things I didn't really think I could achieve. And of course, there's always the post-ride coffee to look forward to! I regularly commute to work on my bike. It is environmentally friendly, I get exercise and it reduces stress. While riding alone is fun, there is something even better riding in a bunch. Not least, is the fact that I get to travel at speeds beyond what I could physically sustain myself. With Gearshifters I have learnt many new bike routes around Wellington, practised bunch riding skills, and met some really great people. To top it off there is the thrill and excitement of setting a goal of completing a ride like the Lake Taupo Cycle Challenge or the Forest Graperide. Like many of us I learnt to ride as a kid. I was always outside doing something. My transport to school was my trusty bike. I would find myself going the long way home partly due to delaying going home but mostly because I wanted to spend more time on my bike. My first job was a paper round and I loved it. I also loved the fact that you got a really good tan! Once I started working in the adult world, my cycling disappeared and it wasn't till about 8 years ago I gave triathlons a go. The longest I cycled then was 20km and I thought it was such a long way. Boy was I wrong! A bit over 3 years ago I was convinced to joining GearShifters by a couple of cyclists that I had been riding a with a bit. To say I was nervous is an understatement. I was thinking what am I doing, I don't feel I belong here. The nerves quickly turned to anticipation and excitement. Everyone is friendly and they are wanting to help you. As soon as the first ride was finished I felt like I was part of the Gearshifters community. I have learnt so much with Gearshifters. Both on the bike and personally. It will become an addiction. I can't imagine my life without Gearshifters. Can't wait for the next season to start and to meet you all. I have always enjoyed the outdoors, havingparticipated in a girls only multisport event, a number of mud challenges andmountain biking. Road cycling seemed thenatural progression and challenge to take on. With new bike and lycras in hand … where doI go now? That’s when I got introducedto GearShifters and am now into my third season with them. First season I eased my way into Taupo takingon the lake with a friend in the relay.Next time around the weather tried to put me (and 10,000 others) offthis great sport, but I endured and completed my first lap of Taupo. Now I’m back to beat my time I set last year. GearShifters provides the perfectopportunity for me to continue learning the art of road cycling, pushing mycomfort zone whilst in the middle of the bunch, continuing to challenge me,always followed by a latte and scone. I am looking forward to another season withGearShifters and also being able to meet new people whiledoing something I love. 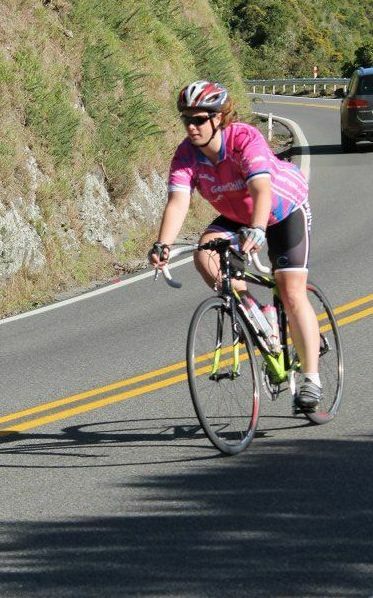 I got my first real taste of cycling when I entered the Lake Taupo Cycle Challenge relay in 2012, where I rode the Kuratau leg on a mountain bike with slicks! The ride/event was such a buzz and I loved every minute of it, even the bee sting! but going all that way for a 40km bike ride seemed a bit excessive, so I decided that the next year I would have to get serious, get a road bike and do some training so I could do the whole 160km. And that is what I did. 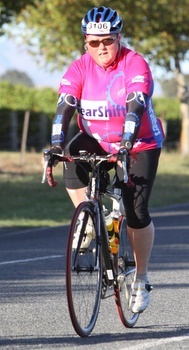 In 2013 I joined GearShifters and I haven’t looked back, this cycling thing is an addiction! GearShifters has taught me so much and I never thought I was voluntarily give up a Saturday morning sleep in, but meeting all the friendly faces on a Saturday morning makes it all worth it. I’m looking forward to another great GearShifters squad. This year I hope to better my time around Taupo and to help you achieve your goals too.